I'm in the middle of M.J. Rose's The Book of Lost Fragrances, and my actual book review will appear tomorrow. In the meantime, I have a synopsis, and a short posting from M.J. as part of her fragrance tour. Jac L'Etoile has always been haunted by the past, her memories infused with the exotic scents that she grew up surrounded by as the heir to a storied French perfume company. In order to flee the pain of those remembrances--and of her mother's suicide--she moved to America. Now, fourteen years later she and her brother have inherited the company along with its financial problems. But when Robbie hints at an earth-shattering discovery in the family archives and then suddenly goes missing--leaving a dead body in his wake--Jac is plunged into a world she thought she'd left behind. GUEST POST - M.J. Rose has written a piece telling us about a lost fragrance. 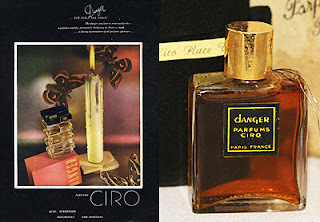 Thank you, M.J.
Ciro parfums emerged in the 1920s and created a number of fragrances which were sold on the US market and presented in flacons of exceptional quality. Danger, created in 1938, carried the marketing line: "not for the timid" and advertising images promised a degree of attraction 'like moths to a flame'. A complex creation, Danger married rich ambery tones and warm, comforting spices to create a dramatic sweet oriental which became one of Ciro's best-selling perfumes. A fleecy, slightly powdery trail left a line of men swooning behind women right up until 1961, when Ciro sadly suspended their operations. M.J. Rose is the international best selling author of eleven novels and two non-fiction books on marketing. Her novel THE BOOK OF LOST FRAGRANCES (Atria/S&S) was published in March 2012. Her fiction and non-fiction has appeared in many magazines and reviews including Oprah Magazine. She has been featured in the New York Times, Newsweek, Time, USA Today and on the Today Show, and NPR radio. 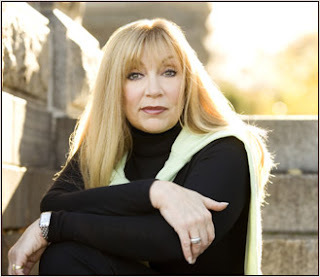 Rose graduated from Syracuse University, spent the '80s in advertising, has a commercial in the Museum of Modern Art in NYC and since 2005 has run the first marketing company for authors - Authorbuzz.com. The television series PAST LIFE, was based on Rose's novels in the Renincarnationist series. She is one of the founding board members of International Thriller Writers and runs the blog- Buzz, Balls & Hype. She is also the co-founder of Peroozal.com and BookTrib.com. For more information on M.J. Rose and her novels, please visit her WEBSITE, MJRose.com. You can also find her on Facebook. 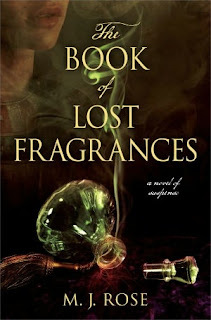 The Book of Lost Fragrances by M.J. Rose. Atria. 2012. ISBN 9781451621303 (hardcover), 352p. I have the last remains of a bottle of Revlon perfume that my mother had as a newly wed. It's amazing how certain scents can evoke such strong memories. Rose's guest post makes me wish I could smell Danger. And, I know when Denise Hamilton spoke at Velma Teague, she went looking in some of our downtown antique shops for some old perfumes, and found some! I would imagine your mother's perfume does evoke strong memories, Rosemary! Lesa, I've just remembered that it was called "Intimate". I also have the dregs of a bottle of Chanel 19 that I was given for my 21st birthday - now the only way I can afford to smother myself in it is to have a go at the 'tester' in John Lewis's when no-one's looking! When I was a student I had a bottle of Yves St Laurent "Opium" - I thought I smelled hugely exotic at the time! Oh, "Opium!" My husband used to buy that for me. He really liked the smell of that on me, Rosemary. That's a lovely memory Lesa. Thank you, Rosemary. As you said, fragrances do bring back memories. Very different, Karen. I hope you enjoy it.